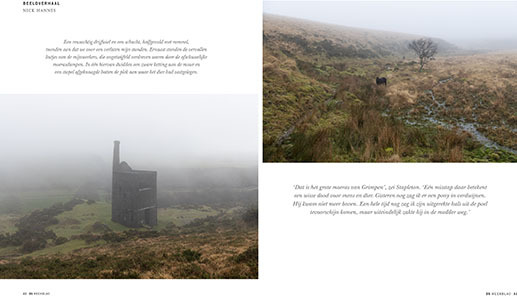 De Standaard Weekblad published a series of foggy photographs I took in Dartmoor National Park (UK) in January 2019. The series is accompanied by quotes from Conan Doyle’s Sherlock Holmes-novel ‘The Hound of the Baskervilles’, a wonderful crime story that takes place in Dartmoor. Mei 1901. 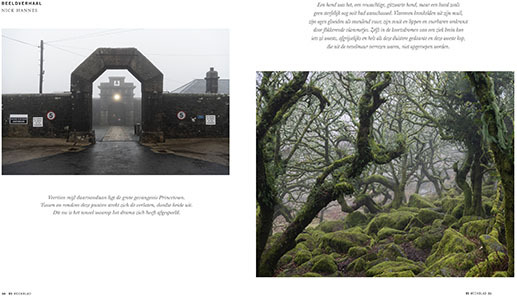 Sir Arthur Conan Doyle (1859-1930) neemt zijn intrek in het Duchy Hotel in Princetown. Samen met zijn vriend Fletcher Robinson maakt hij elke dag een lange tocht doorheen het barre heidelandschap van Dartmoor. De natuur en lokale legendes inspireren hem tot het schrijven van “The Hound of the Baskervilles”. Daarin verkennen Sherlock Holmes en Dr. Watson de mistige moors om de vloek van de hellehond te ontmaskeren. Winter 2019. Op een steenworp van het Duchy Hotel, nu een bezoekerscentrum van het Nationaal Park Dartmoor, huur ik een kamer. In de voetsporen van de Victoriaanse schrijver trek ik de heiden in. “The Hound of the Baskervilles” gidst me naar de plekken die Doyle in zijn boek beschrijft: Grimspound, de tijdelijke schuilplaats van Holmes. Het onheilspellende Nuns Cross Farm, woonplaats van slechterik Stapleton. Princetown Prison, waaruit crimineel Selden ontsnapte. En Fox Tor Mire, het levensgevaarlijke moeras waar de beruchte hond zich verbergt. Dartmoor verkeert in winterslaap. Behalve kraaien en roeken waagt geen dier zich in de hoger gelegen vlakten. De wind rukt er aan mijn kleren. Heuveltoppen hullen zich in flarden mist, die elders aandikken tot miezerige regen – ‘drizzle’ zeggen ze hier. De combinatie van onvoorspelbare natuurelementen en de alomtegenwoordige sporen van langdurige menselijke aanwezigheid – prehistorische dolmens, pokdalige graven en kruisen, vervallen boerderijen, verlaten steengroeven en tinmijnen – oefenen een intimiderende aantrekkingskracht uit, die in de buurt van een spirituele ervaring komt. “The longer one stays here the more does the spirit of the moor sink into one’s soul, its vastness and also its charm”, schrijft Dr. Watson naar Holmes. Of hoe een landschap en een boek elkaar versterken. 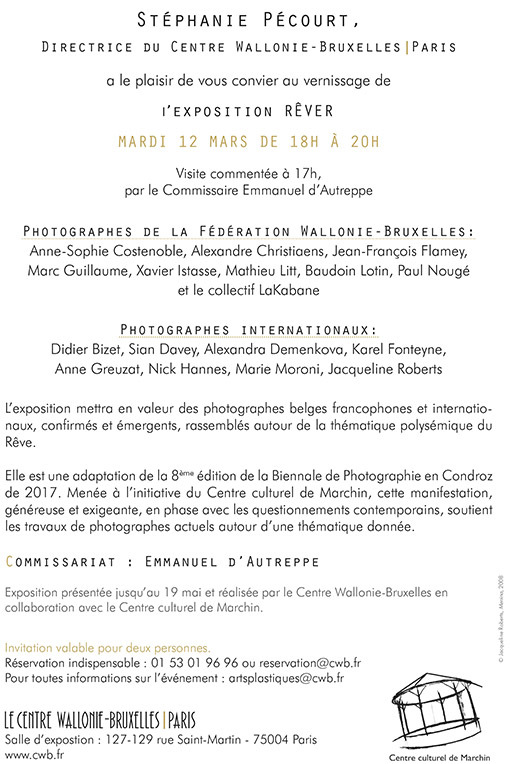 March 12 – May 19, 2019: Group show ‘Rêver’ at Centre Wallonie-Bruxelles à Paris. Curated by Emmanuel D’Autreppe. 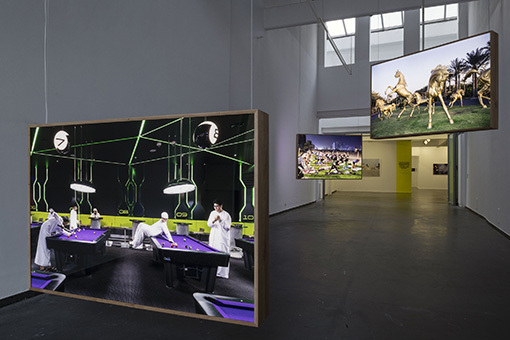 March 9 – May 19, 2019: Group show ‘Civilization: The Way We Live Now’, at the Ullens Center for Contemporary Art, Beijing, China. Curated by William Ewing and Holly Roussell. May 29 – June 16, 2019: A part of ‘Garden of Delight’ will be exhibited at Le Réservoir, during ImageSingulières festival in Sète, France. 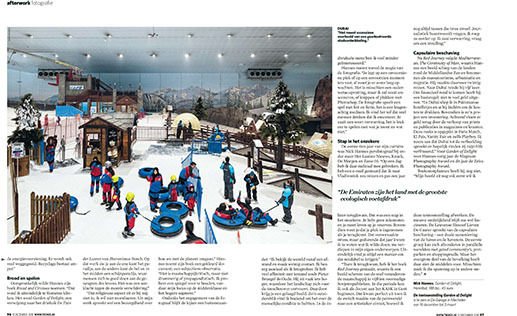 June 20 – 23, 2019: ‘Garden of Delight’ will be part of the 3rd Shenzhen International Photography Exhibition (China), themed ‘City Breath’. July 5, 2019: ‘Garden of Delight’ will be screened at ‘The Night of the Year‘ at the Papeteries Etienne during Les Rencontres d’Arles. 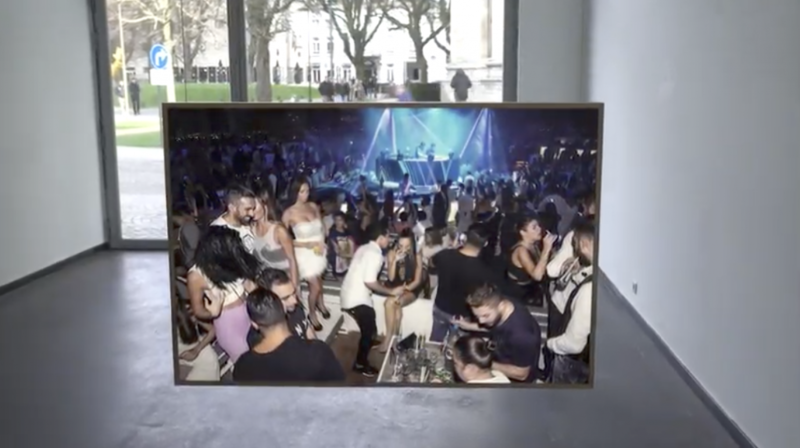 September 20, 2019: Opening of the group show ‘Civilization: The Way We Live Now’, at the National Gallery of Victoria, Melbourne, Australia. Curated by William Ewing and Holly Roussell. September 29, 2018 – April 1, 2019: ‘Mediterranean. The Continuity of Man’, group show “Capitalist Realism” at Photobiennale, Thessaloniki Museum of Photography, Greece. October 18, 2018 – February 17, 2019: Group show ‘Civilization: The Way We Live Now’, at the National Museum of Modern and Contemporary Art / Gwacheon, in Seoul, South Korea. Curated by William Ewing and Holly Roussell. June 23 – September 30, 2018: AntwerpPhoto International Photography Festival – Group show ‘Iconobelge‘ at The Loodswezen in Antwerp (B). June 7 – September 1, 2018: ‘Mediterranean. The Continuity of Man’ + ‘Garden of Delight’ at the Hamburg Triennale of Photography, Germany. June 2 – Septembre 2, 2018: Group show ‘Attraction(s)’, at Biennale de la Photographie de Mulhouse, France. 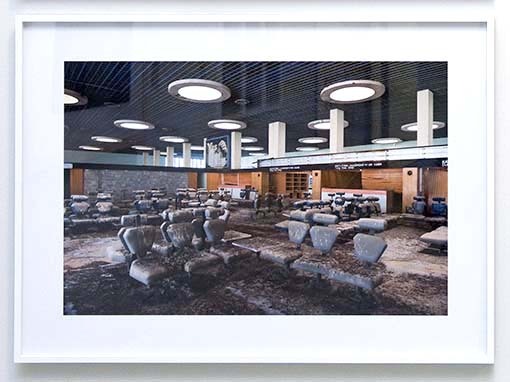 May 24 – July 24, 2018: ‘Half a dozen – Six international photographer’s view on Lisbon’, at Vintage Department, Collectors Marvila, R. Pereira Henriques 6-12, Lisbon (P). With Krzystof Brudlo, Boris Eldagsen, Nick Hannes, Birte Kaufmann, Miho Kajioka, Sarker Protick. May 4 – 30, 2018: ‘Mediterranean. The Continuity of Man’ at Galerija Makina, Pula, Croatia. March 16 – May 13, 2018: ‘Mediterranean. The Continuity of Man’ at 6ème Triennale Photographie et Architecture, Brussels (BE). Curator: Marc Mawet. January 13 – March 20, 2018: ‘Mediterranean. The Continuity of Man’ at Museum of Contemporary Art, Rethymno, Crete, Greece. Group show ‘Critical archives III: Identities’ at Medphoto Festival. November – December 2017: ‘Mediterranean. The Continuity of Man’ at Photolux Biennale internazionale di fotografia, Lucca, Italy. September 1 – October 29, 2017: ‘Mediterranean. The Continuity of Man’ at Städtische Galerie Iserlohn, Germany. September 6 – 20, 2017: ‘Mediterranean. The Continuity of Man’ at Organ Vida Photo Festival, Zaghreb, Croatia. August 5 – 27, 2017: 8ème Biennale de photographie en Condroz, Marchin (BE). I will show a preview of my new series DUBAI. Bread & Circuses’. January 26 – April 16, 2017: ‘Mediterranean. The Continuity of Man’ at Centro Cultural Caja Granada Fundacion, Granada, Spain. January 18 – February 9, 2017: ‘Mediterranean. The Continuity of Man’ at PhotoMed Beirut, Lebanon. June 27 – October 30, 2016: ‘Mediterranean. The Continuity of Man’ at Centro Andaluz de la Fotografia, Almeria, Spain. October 1 – 31, 2016: ‘Mediterranean. The Continuity of Man’ at FotoIstanbul, Turkey. June 9 – July 31, 2016: ‘Mediterranean. The Continuity of Man’ at Athens Photo Festival, Benaki Museum. May 25 – June 19, 2016: ‘Mediterranean. The Continuity of Man’ at photo festival Photomed in Sanary-Sur-Mer, France. June 9 – 19, 2016: ‘Mediterranean. The Continuity of Man’ at Foto Festiwal Lodz, Poland. May 14 – June 12, 2016: ‘Mediterranean. The Continuity of Man’ at Fundación Tres Culturas del Mediterráneo in Sevilla, Spain. April 29 – May 22, 2016: ‘Mediterranean. The Continuity of Man’ at photo festival ‘Head On‘ in Sydney, Australia. April 1 – May 1, 2016: ‘Mediterranean. The Continuity of Man’ at photo festival ‘Photo de Mer‘ in Vannes, France. December 4, 2015 – February 14, 2016: Group show ‘Troubled Water. From Aesthetics to the Global Economy’ at Muzeum Narodowe, Szczecin, Poland. December 19, 2016 – January 31, 2016: ‘Mediterranean. The Continuity of Man’ at C-Mine in Genk (BE). Opening night: Friday, December 18, 2016, 8PM. June 23 – September 30, 2015: ‘Mediterranean. The Continuity of Man’ at the 5th Thessaloniki Biennale of Contemporary Art (Greece). Entitled: ‘Between the Pessimism of the Intellect and the Optimism of the Will’. Curated by Katerina Gregos. Organized by the State Museum of Contemporary Art (SMCA). 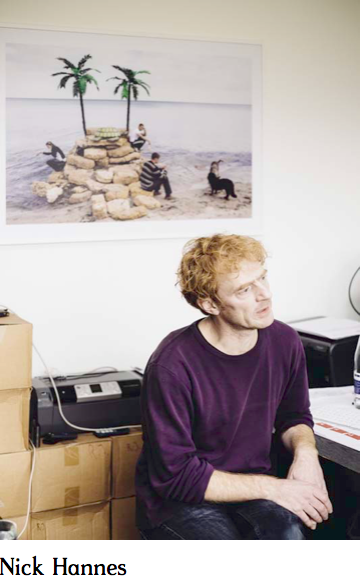 June 11 – august 30, 2015: Group show ‘Facing Japan’ at Museum Dr. Guislain in Ghent (B). Organized by Flanders Center in Osaka. November 27, 2014 – February 1, 2015: ‘Mediterranean. The Continuity of Man‘. At FotoMuseum Antwerp (B). November 15 – December 15, 2014: ‘The Continuity of Man’, preview at Cosmos Galerie in Paris, on the occasion of the 17th edition of Mois de la Photo. September 3 – October 12, 2014: ‘The Continuity of Man’, preview at M. Zilinskas Art Gallery in Kaunas, Lithuania, on the occasion of Kaunas Photo Festival. Part of the group show ‘Generation 1974‘, with works of 11 European photographers who were born in 1974. May 3-18, 2014: ‘Red Journey’ at the 18ième Biennale Internationale de l’Image in Nancy, France. February 8 – April 24, 2011: Group show ‘Finisterre. Jonge fotografie in België’ at FotoMuseum Antwerpen. Curated by Inge Henneman, Rein Deslé and Luc Derycke. May 30 – June 18, 2011: Exhibition ‘Red Journey’ at Flanders Center in Osaka, Japan. Interview on ‘100% Cultuur‘ on the regional television ATV. Prices excl. 21% VAT (6% for edition of 5 or 10). 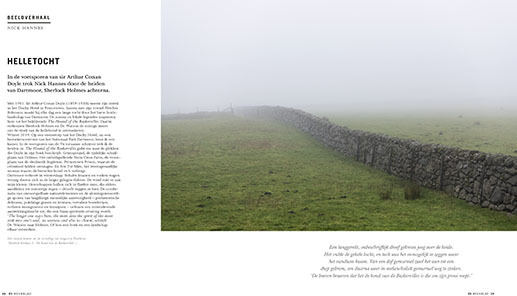 Prints are made by Milo-Profi (Kontich, Belgium), on Epson baryta Photo Rag 315g. Delivered with certificate of authenticity. Contact me on nick_hannes@skynet.be to find out which photographs are available in limited/unlimited edition. 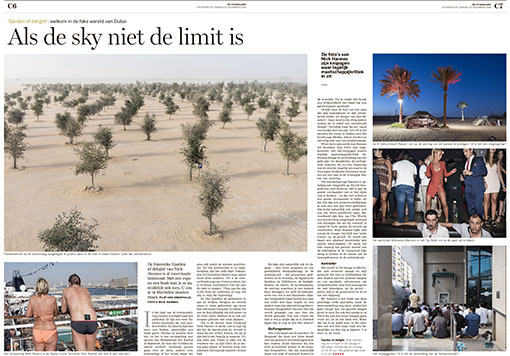 Review on my exhibition ‘Garden of Delight’ in De Standaard, 28 December 2018.